The public is encouraged to drop food donations at any Les Schwab tire center, Wilco farm store or a local FFA chapter. Fall is here which means a trip to the pumpkin patch to enjoy hay rides and caramel apples is likely in store. As the seasons change, the need to help fight hunger across Oregon remains. Those affected by food insecurity are in need year-round, and that is why Les Schwab Tire Centers of Oregon has partnered with Oregon FFA (formerly known as Future Farmers of America) in a Drive Away Hunger Initiative to help raise as much food and awareness as possible. The initiative will take place the entire month of October. Many Oregonians today are suffering from food insecurity and worry about where their next meal may come from. Since 2008, the Oregon Food Bank has seen the demand for emergency food boxes increase by 44 percent. During the month of October, while the Drive Away Hunger Initiative is happening you may see FFA members across the state doing a variety of service activities to raise as much food and funds as possible. Please be on the lookout for activities and collections happening throughout your community. You are encouraged to drop food donations at any Les Schwab Tire Center, Wilco Farm Store, Grange Co-op Store, or your local FFA Chapter. Collection bags are being distributed to subscribers of the Capital Press, East Oregonian, Wallowa County Chieftain, Hermiston Herald, and Blue Mountain Eagle, or you may pick up a collection bag at your local Les Schwab Tire Center, Wilco Farm Store, or Grange Co-op Store. In addition to nonperishable food, the FFA is seeking farm and ranch crop donations. If you would be willing to donate a portion of your food crop, please contact your local FFA chapter or Christa Towery with the Oregon FFA Foundation, at ctowery@oregonffa.com. All donations received will be given to the local food pantries in your community. If there is more food donated than can be used in your community, it will be distributed by the Oregon Food Bank to other pantries throughout the state. Last year the Oregon FFA’s Drive Away Hunger initiative helped raise 510,150 pounds of food which was enough food to provide 382,612 meals. This is a very special project for Oregon FFA members, because they are given the opportunity to live out their motto of “learning to do, doing to learn, earning to live and living to serve.” In this service initiative, FFA members can follow in the footsteps set by those at Les Schwab Tire Centers, as you see them giving back to their communities daily. The Oregon FFA is part of the National FFA Organization, formerly known as the Future Farmers of America, and is a national youth organization of 653,359 student members — all preparing for leadership and careers in the science, business, and technology of agriculture. There are 8,568 FFA chapters in all 50 states, Puerto Rico and the Virgin Islands. 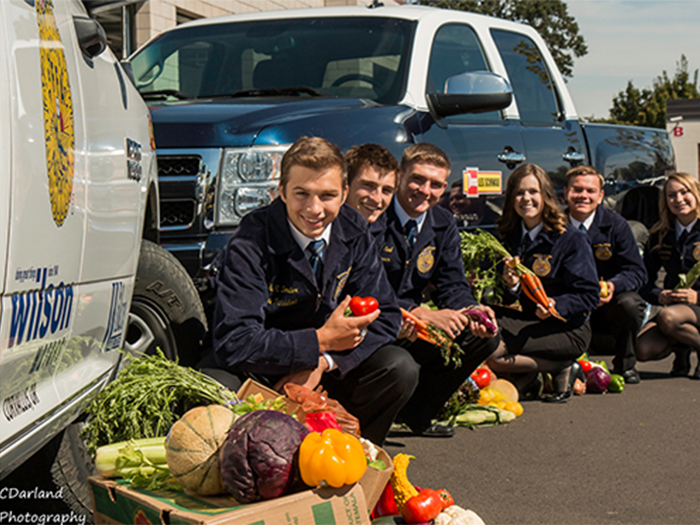 Oregon FFA has more than 6,500 members in 107 chapters across the state. The FFA mission is to make a positive difference in the lives of students by developing their potential for premier leadership, personal growth and career success through agricultural education. To learn more about FFA visit www.oregonffa.comor www.ffa.org.